Tulsa Heartworm Disease and Prevention: Paw Prints Ltd knows Oklahoma is a high risk state for heart-worm disease and as such, we recommend annual testing and yearly heart-worm preventative. Heart worms are transmitted by mosquitoes and are generally a greater issue within urban environments like Tulsa, Generally, heart-worm disease is thought of as a canine disease, but the parasite can be transmitted to cats as well. The parasite that causes heart-worm disease is called Dirofilaria immitis, it is a parasitic round worm that is spread from host to host by mosquitoes. The mosquito passes the larval stage of the heart worm to your pet during a blood meal. Once inside the new host the larvae go through several growth stages migrating through your pets blood stream finally lodging in the heart as adults, where they begin to reproduce. The adults living in the heart can cause significant damage to the heart and valves eventually causing heart failure and death. There are multiple types of mosquitoes that can transmit heart worms, and almost every species of mosquito in Oklahoma is capable of transmitting them. This along with good developmental conditions in our state, puts us in the high risk category for the disease. Some of the species of mosquito that are capable of transmitting heart worms can go through their entire life cycle, from egg to adult feeding stage, within 4 days of 70 to 80 degree weather. Some species have adapted to spread out their life cycle until environmental conditions are ideal to continue development. Due to Oklahoma’s unpredictable weather and the multiple species of mosquitoes capable of spreading this disease from animal to animal, it is important to test for heart-worm disease annually. Here at Paw Prints Ltd. We take heart worm testing seriously because we care about your pets. We test annually for heart worms when your pet comes in for their annual vaccinations and prior to starting heart worm preventative if pets have missed monthly doses. We carry heart worm preventative monthly tablets for your pets in order to ensure their safety. Tulsa Flea Tick Prevention Services: Paw Prints Ltd knows Fleas and ticks are a real problem here in Oklahoma. 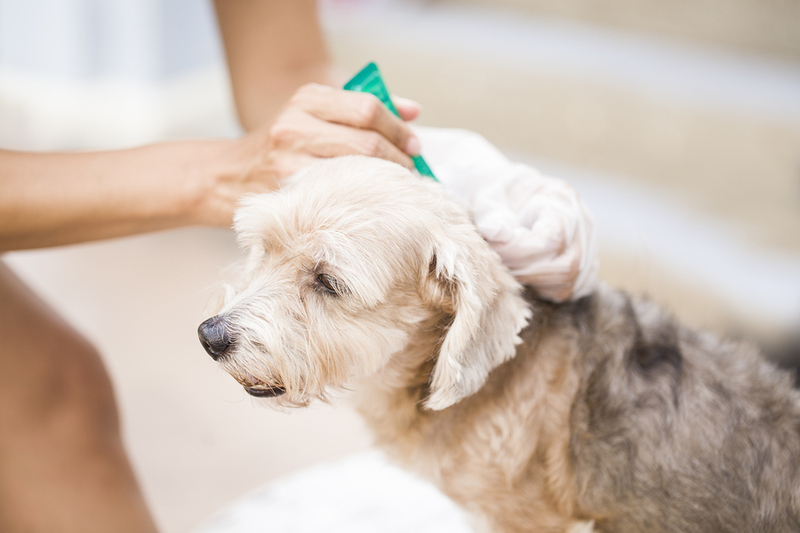 Fleas are a nuisance to your pets, and also to humans as well. Dogs and cats bring these pests in homes and bring diseases with them. The flea life cycle can happen very rapidly in Oklahoma because of the generally warm and humid conditions. The complete flea life cycle from egg to adult can happen in as little as two weeks. The tick life cycle is longer and more complex, taking over a year to reach adulthood. Every tick life stage feeds on blood, making the chance of picking up a disease and transmitting it to your pet very high. Dogs and cats here in Oklahoma can easily get tapeworms from fleas. Once a flea jumps on your pet, they will try their best to get rid of them, mainly by scratching and biting themselves. Fleas are one of the intermediate hosts for tapeworms, once your pet has swallowed a tapeworm laden flea they have then infected themselves providing the ideal environment for the tapeworm to grow and reproduce. Tapeworms can cause your pet to not get the nutrition needed from their normal diet resulting and a general weight loss, and unthriftiness that left untreated may result in a weakened immune system allowing other parasites and diseases to invade your pet. Ticks can carry many diseases that are transmissible to both humans and other pets. In Oklahoma, they commonly transmit Rocky Mountain Spotted Fever, Ehrlichiosis, tick paralysis, and Lyme disease. Tick borne diseases are very serious, sometimes deadly, symptoms may not be evident until your pet is very ill.
Prevention is the best practice when it comes to fleas and ticks. Here at Paw Prints Ltd., we have several different options for preventing fleas and ticks from bothering your pets. For cats we have a topical preventative that is placed on the skin of the cat once monthly. For dogs there is a monthly topical application or an easy to use tasty chewable pill that works for three months. This option is ideal for dogs that are groomed or swim frequently.